I love to make fresh almond milk and customize it with all kinds of interesting super foods and nutrients. 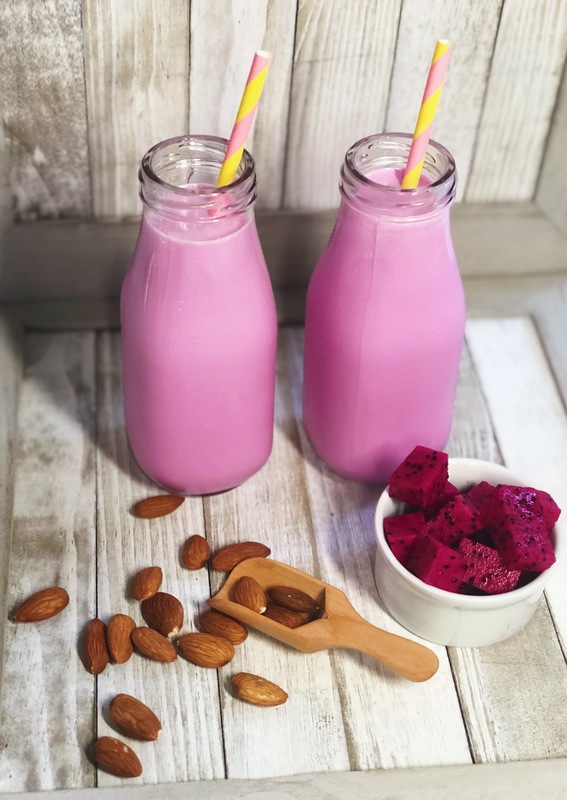 Since I found a giant pink dragon fruit at my local grocery store, I decided to create a pink beauty collagen milk, which is not only delicious, but is filled with nutrients you need to keep your skin, hair, and nails growing strong and beautiful. Dragon Fruit is also known as Pitaya. It tastes a bit like a kiwi (has a similar texture), and the flesh can either be pink, red or white. The flesh is studded with tiny seeds, which provide both fiber and omega 3 fatty acids. Since the one I found was bright pink, I made a number of delicious recipes with it, including my bright pink lemonade. You can also blend it up into a gorgeous smoothie bowl too. Dragon fruit is a powerful antioxidant and contains a plethora of Vitamins and Minerals. I made this into a “beauty” milk by way of adding Vegetal Silica, which is a great vegan alternative to bovine collagen for beautifying your skin, hair and nails. There is little to no scientific evidence supporting the notion that ingesting hydrolyzed animal collagen has any effect whatsoever on your skin. However, there is plenty of peer-reviewed evidence to support that fact that plant-based silica (or silicon),may well be your key to gorgeous skin, hair, and nails (and help with strong bones too!) Here’s the deal – Silica helps with collagen synthesis. Our bodies make collagen, and the biggest component of all the different kinds of collagen in our body, is silica. When collagen is damaged (aging skin hello!!! ), silica is required to rebuild and regenerate this connective tissue. So, in my mind, in makes sense to take a silica supplement, and play around with adding it to delicious recipes such as this beauty milk. And check out my brand new You Tube video on exactly how to make it. ** You can also choose to use Bamboo Silica, which some think is more effective in triggering collagen production. Pop the soaked almonds and water in a high-speed blender and blend on high for about 30 – 60 seconds. Use cheesecloth or a nut milk bag to strain. I prefer a nut milk bag as it makes things really easy! Once strained (you can dry out the leftover meal and use for baking), rinse out the blender and then pour your fresh almond milk into the blender. Add the remaining ingredients and blend for about 20 seconds on high. Pour into a glass jar, and chill it for a few hours. If you want to enjoy it immediately, you could add 1/2 cup of crushed ice to the blender. You can store for up to 3 days in the fridge, but you will need to give it a good shake before drinking.